Cabinet members have tonight agreed the draft Budget 2019-20 for Thanet District Council. The budget recommendations will now go to Full Council on Thursday 7 February for approval. The budget is set at the same time annually in order to set the coming year’s Council Tax for the residents of Thanet and to meet the council’s legal obligation to produce a balanced budget. The report sets out the council’s current financial position and its proposed approach to meet an identified budget gap of £1.3 million in 2019-20. (Proposals identified below). This includes a proposed 2.99% rise in Thanet District Council’s element of Council Tax which equates to an annual increase of £6.75 for the average band D property. Thanet District Council receives just 13p in every £1 of Council Tax. The remainder goes to: Kent County Council, Kent Police, Kent Police and Crime Commissioner, Kent Fire and Rescue Service and Town/Parish Councils. These savings relate to a combination of contractual savings; savings from the purchase of Mill Lane car park; and increased income from summonses. The council is continuing with its strategy to achieve a ferry operation for the Port of Ramsgate. Should this commence, this will provide sufficient income to cover the savings required of £630,000. In the event this is not achieved, the council will be making cost reductions at the Port. These costs have been incurred keeping the Port in a state of readiness for a ferry operation. See Cabinet report para 8.4 page 12. We are working directly with services to identify how we can work differently and more efficiently to achieve the savings required. We will be looking early in the year to deliver this. This will be achieved as a result of slightly higher interest rates and treasury management investment decisions. This saving will be achieved through the deletion of the post which is currently vacant. The council will be reviewing the way it delivers the cleaning of its offices and buildings to work more efficiently. The council will be reviewing its overall asset base including undertaking a review of public toilet provision, pavilions and shelters. Last year’s budget included growth to accommodate the substantial pressure on the housing service as a result of increased homelessness. This investment has helped the council to prevent more households from becoming homeless than in any previous year and to reduce the use of temporary accommodation. All of the new officers that joined the team are also now permanently employed. The Homelessness service will still have £350,000 more funding than in 2017-18 and is confident that results can continue to be achieved. We will be working with EK Services to review how these efficiencies can be achieved. The seasonal toilets managed by Thanet District Council are now open, and have been since early April, ahead of what is anticipated to be a busy summer season. This brings the total number of public conveniences currently open across the district to 27, up from 20 during the off season. 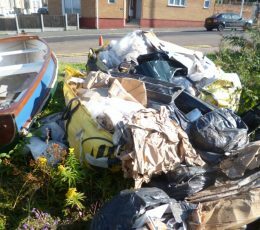 A Margate resident was found guilty of an historic fly-tipping incident on Tuesday 2 April at Medway Magistrates’ Court. He received a 12 month Community Order and was ordered to pay more than £2,700 in costs.